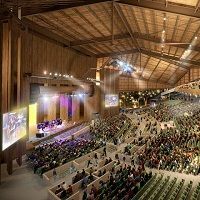 The performance center in Fairmount Park, which was built as a summer venue for the Philadelphia Orchestra but has since branched out into other genres and art forms, is trying to bring in the final third of its $43.5 million fundraising goal. (The money will finance new community initiatives, an endowment and cash reserves, and badly-needed repairs.) So naming rights are being made available for everything from individual seats ($500) to the pavilion ($5 million) and even the entire center ($25 million to put your name in place of Mann’s).